NEW YORK -- A New York City doorman is the first death reported from a winter blast that hit the region Thursday. 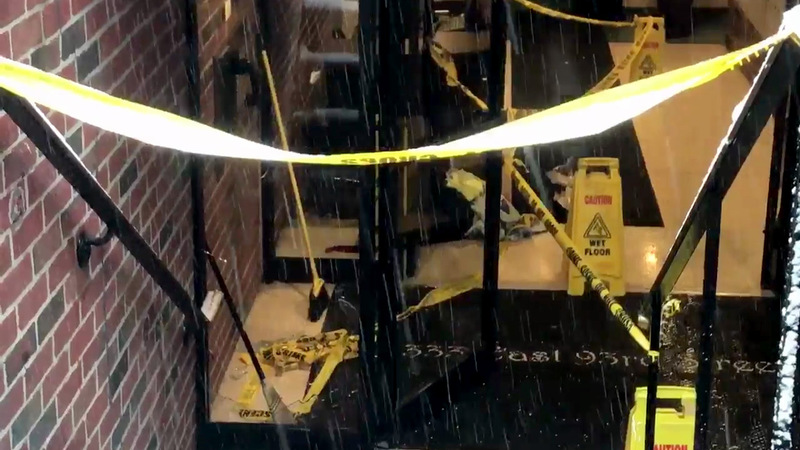 The incident happened at about 9:30 a.m. on East 93rd Street between First Avenue and Second Avenue on the city's Upper East Side. Officials said the doorman fell through a glass window while shoveling snow. He sustained cuts to his neck and face, and was pronounced dead at the hospital. He has been identified as 59-year-old Miguel Gonzalez. "It's a reminder to be very careful when you're shoveling," NYC Mayor Bill de Blasio said. "If you're not up to shoveling, don't shovel. Take breaks - all of those common sense rules. We don't know what happened in this case - just want to remind people to take it seriously." "We are deeply saddened by the loss of doorman and 32BJ member Miguel Gonzalez, who passed away this morning while shoveling snow at the building where he worked for many years. Our thoughts and prayers are with his wife and children and all those who knew and cared about him, including his coworkers and the residents of the building. Our union family will do all we can to support Miguel's family in this difficult time. Our thoughts and prayers also go out to all the members working hard to keep us safe during this blizzard and every day." The Tri-State area is getting walloped by a snowstorm Thursday, with towns and residents dealing with significant accumulations. Suffolk County, which is expected to see the highest totals in excess of a foot, declared a state of emergency, and New York City Mayor Bill de Blasio closed all of New York City's public schools. "I want to emphasize to all New Yorkers, stay inside if you can," de Blasio said. "Don't go out if you don't have to. If you need to go out, please don't use your car, because we need to let our sanitation department clear the roads." Schools were closed in most places, including all CUNY campuses, and government offices told most non-essential workers to stay home. Police across the area were responding to dozens if not hundreds of accidents, though at this point, no serious injuries have been reported. Bundled-up commuters carefully navigated snow-covered sidewalks, where blowing snow stung any exposed skin. New York Gov. Andrew Cuomo urged New Yorkers to prepare for dangerous conditions. "As Mother Nature once again tests the resilience and strength of this state, I urge New Yorkers to plan ahead, stay informed, and above all, stay safe," Cuomo said. "I have directed state agencies to closely monitor conditions and to clear roadways as quickly as possible in order to avoid accidents and keep our roadways safe. I encourage everyone in the path of these storms to use extra caution and avoid unnecessary travel during these hazardous weather conditions." The expectation of upwards of a foot of snow is bringing out the city's heavy equipment. The Department of Sanitation has 2,400 workers and 1,600 plows working 12-hour shifts across the city. Prior to the plowing that began after 2 inches of accumulation, 689 salt spreaders were out during the early snow hours. The city has a large stockpile of salt -- 315,000 tons -- for streets and sidewalks. "Should we end up on the high side of the accumulation at 12 inches, we will roll out front-end loaders," Sanitation Commissioner Kathryn Garcia said. "We have 134 set to roll out." A Blizzard Warning is in effect for Nassau and Suffolk counties until 6 p.m., and Suffolk County Executive Steve Bellone has declared a state of emergency. Travel is hazardous due to snow-covered roads and poor visibility, and scattered power outages were reported along with blowing and drifting snow. Public officials warned residents not to be complacent and to stay off the roads, only venturing out if travel is absolutely necessary. Public works crews scrambled to clear roads, while LIRR workers cleared snow from train platforms. All Suffolk County public buses have been discontinued for the day. Kristin Thorne has more on the conditions from Dix Hills. Rockland County Executive Ed Day declared a State of Emergency due to the heavy snow and deteriorating weather conditions. The declaration, effective immediately, bans travel on all county and local roads for all but essential business. "This state of emergency has been declared due to extreme weather conditions, which may endanger the public, including and emergency responders and rescue teams," Day said. "And due to snow and ice conditions requiring that the state, county and local authorities have free access to the roadways to abate conditions hazardous to travelers." The county government is open, but the Rockland Department of Public Transportation has suspended all bus service, including TRIPS, TOR and the Tappan Zee Express. Heavy snow is ending across New Jersey, but motorists will face icy conditions heading home from work. The fast-moving storm on Thursday hit the northern part of the state first before pushing south. Accumulations range from 10 inches in Vernon to 6.5 inches in Basking Ridge and 2 inches in Freehold Township. South Jersey was spared the heaviest snow. The state Transportation Department says it has more than 2,300 plows and salt spreaders on the highways, but temperatures remain below freezing and driving is slick. Some power outages were reported, and PSE&G and JCP&L were working to restore services. "We have additional personnel scheduled and on standby, with extra tree crews and equipment at the ready," PSE&G senior vice president of electric and gas operations John Latka said. "We're prepared for whatever the storm brings our way." Anthony Johnson has more on conditions from Franklin Lakes. Customers were advised to prepare an emergency kit that includes a gallon of water per day for three days, a first aid kit and a flashlight. PSE&G also urges customers not to run any gasoline powered engine, including generators and snowblowers, in a garage or any other enclosed space to prevent carbon monoxide poisoning. To report downed wires or power outages, call PSE&G's Customer Service line at 1-800-436-PSEG.